Summer is less than two weeks away, but it has already set in and made its presence felt. The hot steamy days and their warm nights have me reluctantly closing my bedroom windows and finding refuge in the cool crispness of the air conditioning. On the evenings that are not as warm or rainy, there are twilight strolls. Leisurely walks passed the overgrown honeysuckle shrubs where the aroma is heavenly and I am completely saturated in the aroma of the honeysuckle blossoms. Summer is forever synonymous with the scent of honeysuckle blossoms. The other main part of summer, is the fruit. Oh the fruit! Sometimes my obsession with the colorful fruits of the summer months has me wondering if there is something wrong with me. Searching the farmer’s market for the first crop of whichever fruit is ripe for the picking and eagerly awaiting the arrival of the next new fruit variety to “come out.” As if it were concert tickets or the next book in a series being released. Each one makes me giddy and it never becomes old. Every fruit has its memories for me and seeing them is almost like reuniting with an old friend. A delicious, tasty, juicy old friend. See? I might have a problem. Most recently apricots and I were reunited, at long last. After consuming my fair share of their brilliant orange-hued juiciness, it was time to preserve the remaining apricots. What better way than to create pate de fruit. Pate de fruit (fruit jellies) are a classic French candy bursting with bright fruit flavor and color. They are mainly composed of fruit puree, sugar, and apple pectin. The apple pectin acts as the gelling agent that gives this candy its firmness to hold its shape, but still the smooth and soft mouth-feel in each bite. 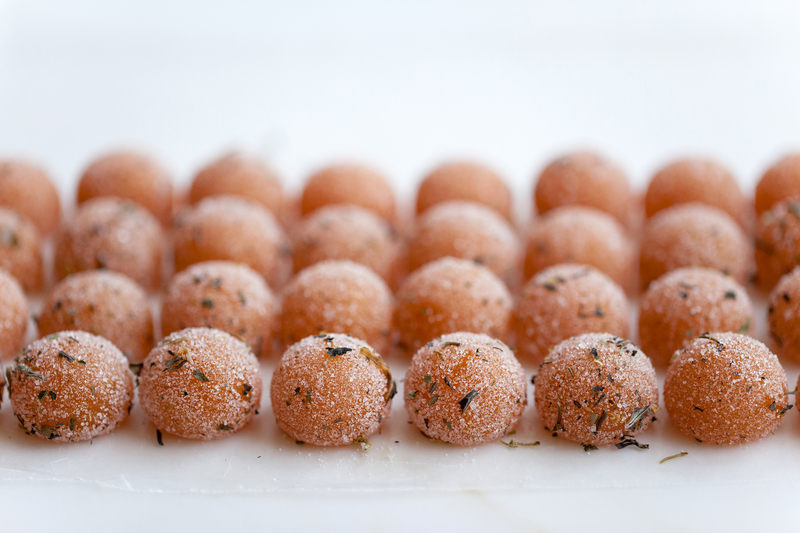 Each pate de fruit is rolled in a sugar coating that seals in its flavor and adds a nice crunch to the exterior. Pate de fruit are a traditional confection, so at times they can be in danger of becoming redundant or a bit boring. In order to deviate a little from the traditional, an infused sugar seemed exciting and a way to play with our senses a bit more. After having my head filled with the fragrance of honeysuckle it seemed only natural to create a Honeysuckle White Tea infused sugar. 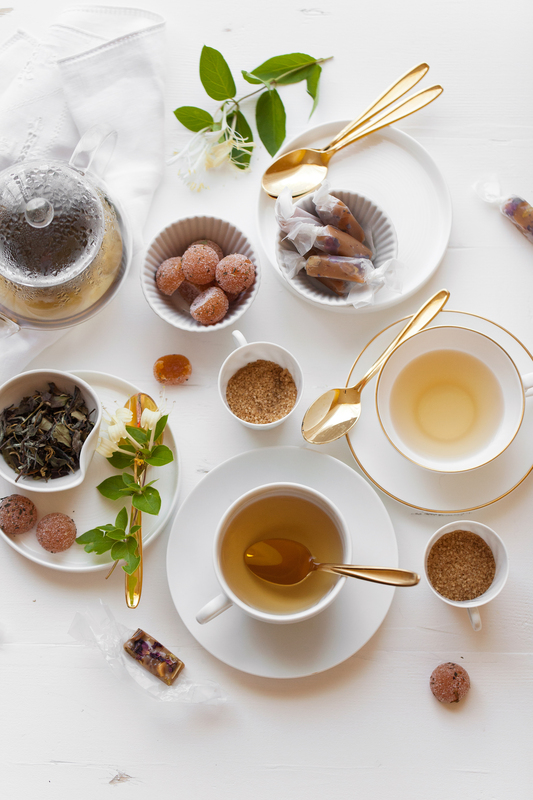 Shang Tea, here in Kansas City, creates the most aromatic organic White Peony King tea leaves combined with Wild Honeysuckle Flowers. Its aroma is breathtaking and after allowing the infused sugar to rest for several days, it only becomes stronger. The waiting for the sugar to infuse is well worth it when you go to take your first bite of these Apricot Honeysuckle White Tea Pate de Fruit. First you feel the crisp sugar coating in your fingers, as you bring it to your mouth the honeysuckle aroma wafts into your face, and finally the sweet and tart apricot flavor rest on your tongue. A small feast for the senses. In a small air tight container, combine sugar and tea leaves with your fingers. Crush the leaves into the sugar to break them into bits. 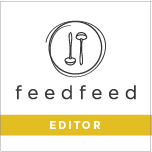 If finer tea leaf pieces are desired, place sugar and tea leaves in a food processor and pulse until fine. Cover and allow to set for up to one week. Place dome shaped silicone mold on a sheet pan and set it on a wire rack for cooling. If not using a silicone mold, line an 8×8 baking pan with parchment (cut two large strips to overlap inside of baking pan, with edges hanging over the sides of pan). In a small bowl, thoroughly combine portion #1 of sugar and yellow pectin. Mix well or the pectin will clump together when added to the puree. In a medium size stainless steel pot, whisk together the apricot puree and sugar-pectin mixture. Turn heat on to medium-high, constantly whisking to prevent scorching, and bring to a soft boil. Add glucose and whisk to combine, then bring back to a boil. Add portion #2 of sugar in two stages: add first portion, whisk in, bring back to a boil and then add second portion, whisk in, bring back to boil. Cook mixture, whisking constantly, until temperature reaches 224F (107C). This will take around 10-15 minutes. Remove from heat and immediately pour mixture into a confectionery funnel or large glass measuring cup. Carefully and quickly, pour mixture into cavities of silicone mold until full. If using a parchment lined 8×8 baking pan, simple pour the hot mixture directly from the pot into the pan. Allow pate de fruit to cool completely and set overnight, uncovered. When ready, invert each mold cavity and pop out each apricot pate de fruit. Gently roll each piece in the Honeysuckle White Tea mixture until fully coated. Alternately, remove pate de fruit from 8×8 baking pan and remove parchment paper. Using a sharp chef knife, cut pate de fruit into squares or any desired shape with decorative cookie cutters, then coat with infused sugar. Store pate de fruit in an airtight container for up to one week. Enjoy! *If making the puree from fresh apricots, approximately two pounds of fresh apricots should give you the 500g you will need. 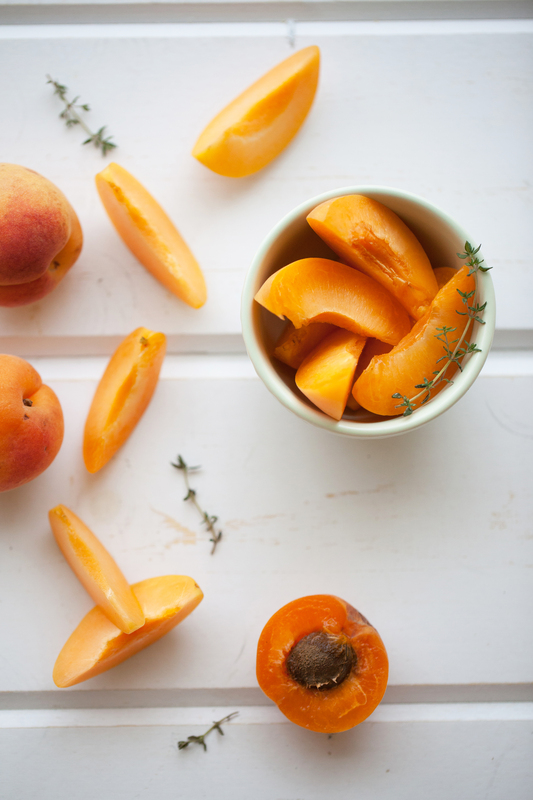 To puree: Quarter apricots, remove pits, and process in a food processor for several minutes until completely smooth. Strain through a fine mesh sieve, into a clean bowl. Scale out the amount needed and store the rest in anairtight container in fridge or freezer. **If tartaric acid is not available, you may substitute it with citric acid (found at many health food stores). If you are really in a pinch, you may use lemon juice, but it is not as strong so the flavor will be slightly different than the original recipe. Recipe based on Les Vergers Boiron Pate de Fruit Table. Thank you for such kind words. Coming from such a talented photographer and stylist as yourself, it is truly humbling. The admiration is mutual and I look forward to seeing more of your future work, on The Spice Train. Thank you for stopping by!